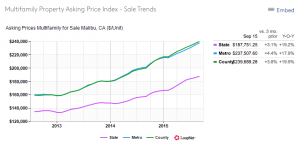 4 Malibu Real Estate also works on commercial property throughout Malibu and the Greater Los Angeles area. 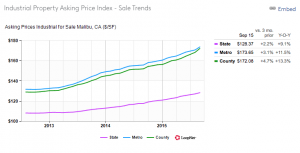 A significant portion of property is bought with the intention to lease and 4 Malibu carries extensive knowledge of the financial, and regulatory aspects of owning this type of property. Investors are increasingly confident about acquiring assets, bolstered by attractive financing and still-attractive assets in the marketplace. We should expect to see multifamily continue to lead the Palio for investment activity, particularly in urban and infill locations and especially in transit-oriented locations, followed by industrial properties, hotels, office, and retail. Investors are moving into an array of asset choices in a widening number of markets as they seek ever more attractive yields. Interest rates do not appear ready to rise substantially in the near to medium term (especially in light of the Fed’s ongoing accommodative stance and massive deflationary factors gathering momentum), and cap rates—even in many secondary markets—will continue to compress, creating negative spreads in some larger gateway markets for the first time in many years—a worrisome sign. While new construction has begun to pick up in a few areas, new product does not appear likely to offset positive absorption trends. 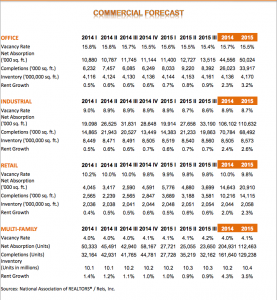 The outlook for 2015 is that commercial real estate fundamentals will continue to improve. Increased allocations and capital flows. With most institutions—not to mention high-net-worth investors—still being underallocated to real estate, we can expect more investment capital coming into commercial real estate. The significant amount of capital would be vexing if not for the fact that real estate seems to offer some of the best risk/reward propositions around, particularly given the multiyear run-up in equity and bond values. Look for higher allocation targets, and more foreign and retail investor money to continue to push capital values up well beyond the 2007 peaks, which should be cause for concern. Continued low supply. 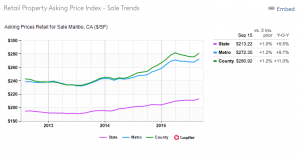 New supply is at a historic low in part because market rents generally have not justified new construction and because financing has remained constrained. This leaves enormous upside potential in the property sectors to push occupancies and rents. Investors continue to follow the jobs and people. Markets such as San Francisco, Austin, Seattle, and others have demonstrated advantageous population and job growth dynamics. Many of the jobs that are created in those cities are tied to technology as well as to energy and banking. Employment growth in the San Francisco area, for instance, outpaced the nation’s last year, with job gains exceeding 4 percent, and San Francisco is among the top tier of cities where a solid mix of job-creating industries is concentrated. Other Pacific Coast cities, including Seattle and Portland, also exhibit high concentrations of job-creating industries, driven in large part by technology. Other metropolitan areas, including Washington, D.C., with its still-substantial government employment base and growing financial services and technology sectors, and Houston, with its enormous energy sector and export machine, promise to be near the top of any list for investment—and not just in the office sector. Multifamily still popular. Multifamily transaction volume has reached pre-recession levels, outstripping office transactions for the first time in ten years, as real estate investment trusts (REITs) and pension funds have fed a fierce appetite for the multifamily sector. The pace is unlikely to slow anytime soon. Apartment demand has been—and is expected to be—robust, supercharged by the shock waves of the recession and by strong demographic trends that are only beginning to manifest. And, as values moved ever higher, cap rates fell back toward 6 percent, close to where they stood in 2005 and 2006. Most deals have been concentrated in larger urban markets, such as New York, Washington, Los Angeles, and Chicago, with considerable focus on the echo boomers, who are partial to the amenities of an urban lifestyle, and their parents, who are realigning their housing needs toward walkable surroundings and mass transit. Industrial continues its steady improvement. Industrial real estate is subject to the whims of the national and global economies, as imports and exports wax and wane with the crises of the day, week, or month. There have been indications that economic slowing overseas has undermined some growth at some of the major ports and larger airports. And, as retailers move to be closer to customers, some intermediate warehouse points have suffered modest retrenchment. Demand for industrial space—particularly in gateway markets—has been growing. Economic recovery and an upward trajectory in consumer spending, on furniture and electronics especially, have led to the absorption in many major markets, and there has been considerable “trickle-down” into secondary markets, including the Inland Empire of southern California, Sacramento, and Charlotte.